MUSCAT, Oman—Painting a dark outlook for the global economy, the International Monetary Fund on Thursday issued an “urgent” call for the world’s largest economies to roll out more growth-boosting policies. The IMF said central banks need to maintain their easy-money policies and the Group of 20 largest economies must prepare contingency plans should a stagnating outlook turn into a downturn. Federal Reserve officials are looking more confidently toward an interest-rate increase before the end of the year, possibly as soon as September, as financial markets have stabilized after Britain’s vote to leave the European Union and the economy shows signs of picking up. Jon Hilsenrath at the Wall Street Journal is an excellent journalist. He often scoops his peers by getting people to talk to him off the record. His main line is into anonymous Fed staffers in Washington – aka the Fedborg. The Fedborg is the consensus of backoffice staff who have tirelessly argued for “normalization” of monetary policy, i.e. raising rates to historical norms despite massive evidence that inflation and nominal growth are miles below healthy historical norms. The Fedborg seems to believe that preservation of financial stability is more important than prosperity. The fact that time and again this elevation of financial stability over prosperity leads to financial instability seems to keep eluding them. Such a message would get the attention of traders in futures markets, who see low chances for the Fed moving as early as September. In early June, traders on the Chicago Mercantile Exchange placed a probability of greater than 60% that the Fed would raise short-term rates by at least a quarter percentage point by its September policy meeting, according to the CME. The probability dropped sharply after a weak May jobs report and the June 23 Brexit vote and was just 12% on Monday. As Hilsenrath weaves into his story, public comments by various hawkish regional governors have been again trying to talk up more rate rises than the market expects. But the chatter has had very little impact. So the un-named “officials” have given Hilsenrath his scoop. The officials have upped the ante and tried to get the market to take the regional governors more seriously. The Fedborg is not at all happy that it keeps getting overruled by more sensible regional governors in alliance with more sensible permanent Fed members like Lael Brainard. So, the Fedborg stoops to spin pressuring markets and the sensible governors alike. We hope that the they will fail again, but what really needs to happen is a Kocherlakota “house cleaning” of these back office experts and their replacement with more rounded, sensible, evidence-based, pro-prosperity types. Or they could just recognise their errors and stop pushing financial stability that results in financial instability. Although in the short term the Fed can often influence rates in the way they wish ultimately it depends on the market. The market ultimately will send rates down if the Fed tries to raise them now. What happens when you let NGDP Drop below the trend level target? The Reserve Bank of Australia has drafted an emergency playbook to follow the world’s major central banks in embracing extreme monetary policy as global interest rates stumble to historic lows and the Australian dollar stays stubbornly high. Addressing members of the Committee for Economic Development of Australia (CEDA) lunch in Adelaide, he said monetary policy aimed at encouraging business investment and generating employment amid global economic weakness was in danger of creating a housing bubble in Australia. The Reserve Bank of Australia’s surprise decision to defer its widely anticipated April rate cut for at least another month might have been influenced by the increasingly pricey housing market, which it regards as posing a real “dilemma”. According to UBS, in March the ratio of Australian dwelling prices-to-disposable household incomes equalled – and is presently surpassing – the previous record of 5.3 times set back in September 2003. And they predict it will climb further. 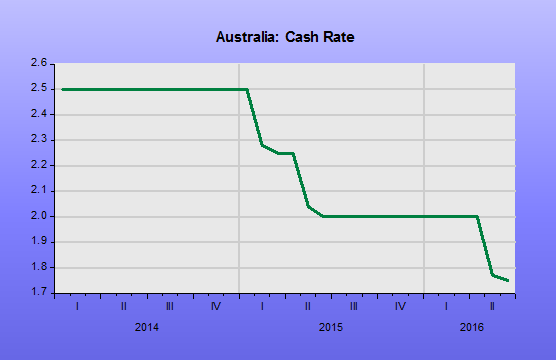 The policy interest rate has been lowered significantly. So what? That only means that monetary policy has been tight, something easily gleaned from the behavior of NGDP growth and inflation. 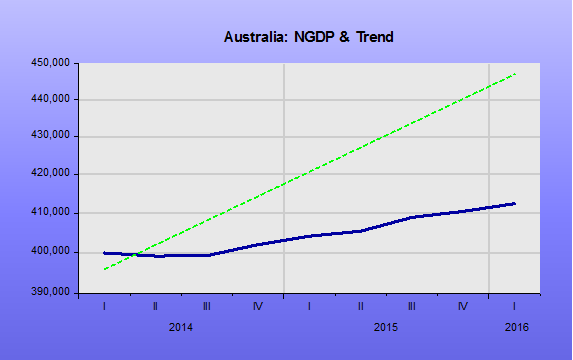 What Australia should do is try to get NGDP back on trend, which has served it well. Tim Duy provides an excellent summary of the state of play in the US economy from last week’s data releases. While Duy lands on the side of caution in terms of rate rises he is still unsure about what the Fed is actually targeting. I don’t think Duy is cautious enough because the Fed should drop all ideas of rate rises in the future, and not just talk about delaying them. A neutral stance rather than their current stop-start tightening bias is most appropriate. 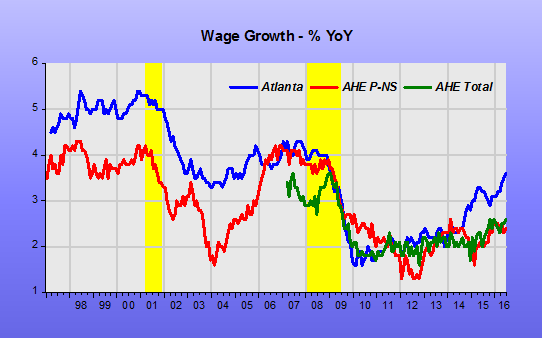 One of his charts shows wage growth over the last 20 years. I think it shows just how far the US has yet to go in terms of achieving a healthy economy that needs any monetary tightening. Back in the 1990s hourly wage growth was running at around a nominal 4%. 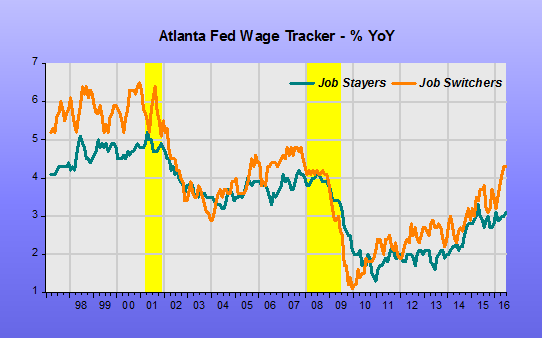 The Atlanta Fed wage growth showing wage growth for those in work for at least 12m was running at 5% – the difference being that those in temporary or part-time employment often see less wage growth. Looking at just the Atlanta Fed data itself, there is a fascinating breakdown between different categories of employed workers. Particularly job stayers vs job switchers. A healthy labor market, from the point of view of labor, is one where there is a good degree of job switching. It is also healthy from the point of view of the economy in that it allows good nominal growth to do its magic. One where workers who perform less well (are less productive) than average or in firms of industries doing less well than average, see their nominal pay rise but by less than those doing better (more productive) than average or in firms or industries doing better than average. In real terms those doing less well than average or in firms or industries doing less well than average will see smaller rises or even possibly small falls. This is an excellent result as it allows relative winners and losers to emerge yet without compulsory job losses. Productivity rises as those workers more productive than average or in firms and industries more productive than average do better. The result is real economic growth for all. In the 1997-2001 period job switchers (those who were recognised as being more productive) did significantly better than average – and there was a productivity boom. Between 2002-2006 the weak recovery did not see this pattern repeated, although it was emerging by 2006 just as the Fed began to apply the monetary brakes. The story post 2008 is dreadful. Monetary tightness has prevented not only any significant nominal wage growth but also any healthy differentiation – and any productivity growth to boot. It is only in the last few quarters that there has been any signs of healthy wage growth and again the beginnings of some healthy differentiation – differentiation in wage growth between job-stayers and job-switchers that leads to productivity growth. Yet what do we see? A Fed already intent on repeating its historic 2007-2008 mistake of tightening monetary policy when on the cusp of a healthy labor market. What a tragedy! No wonder economic populism came close to winning the Democratic nomination, has won the Republican nomination and may yet win the Presidential election. Elites reap what they have sown (see Brexit). Neglect nominal GDP growth at your peril. The UK has a new Chancellor of the Exchequer this weekend, Philip Hammond. Encouragingly he has studied at least some economics having read the infamous PPE course at Oxford, more than could be said for George Osborne who just read Modern History. Although Hammond was awarded a 1st we don’t know (yet) whether he specialised in the Politics bit (hopefully, little), the Philosophy bit (OK’ish) or the Economics bit (hopefully a lot). The fact that he has been in business and especially property development is reasonably encouraging. He should recognise the need for nominal growth across the economy, as economic actors live in the (real) nominal world and not in artificial constructs like inflation and Real GDP. Commission his UK Treasury to update the 2013 Review of the monetary policy framework. The strict inflation targeting was more or less reaffirmed but has failed to get inflation up to, let alone averaging, 2%. The grand line-up of public and private sector economists who criticised NGDP targeting should all be asked back to justify the failure of IT to deliver. 2. Downgrade the essentially arbitrary inflation target of 2% as secondary to a target of 5% growth in underlying nominal GDP. This growth rate of 5% is about right for nominal wage or income growth such that an economy has flexibility to cope with shocks and not lead to involuntary unemployment and recessions. This level will also allow much greater relative real wage and income flexibility, which in turn will allow for relatively more productive individuals and firms to be rewarded by real rises in wages and incomes, and for less productive ones to be let down gently in real terms but still grow (more or less) in nominal terms. Productivity will rise, people will be happier and you will be more popular. 2.1. If this is too much change in one step, move to a properly assessed dual target of inflation in a range of 1-3% with the flexibility coming from reference to real growth in GDP. It is imperative to stop the 2% target becoming, as it may already have done, a 2% ceiling to projections two years out. 3. Issue some government bonds tied to a 24 month moving average of NGDP or, better still, sponsor an NGDP Growth Futures market and target NGDP growth one or two years ahead. Do not target current or historic NGDP as there is always noise in that data that needs to settle down as estimates become actuals and errors corrected. CPI is an unwise target as it is an economic and politically-sensitive index that cannot be corrected for its inevitable errors – except when the whole framework is revised like with the switch from RPI. Brexit devaluation: Reasoning from a price change? One of Scott Sumner’s great contributions to economics (blogging) has been his oft-repeated mantra of “not reasoning from a price change”. Probably its most familiar usage is related to the oil price, although there are many, many more. The 2014 collapse in oil prices was heralded by many financial types and economists as a great boon to wealth creation, a sort of hidden tax cut. What Scott tirelessly pointed out is that if the oil price drop was as a result of a drop in demand then the cut in price would not herald a rise in wealth, but was more a consequence of a fall in wealth. While many thought the fall in price was related to supply it did also coincide with the great monetary tightening that followed on from the end of QE3 and the rise and rise of the USD further confirmed this thesis. There were no wild consumer celebrations of the oil price fall, things carried on pretty much as usual: the dull, low growth environment. Similarly, earlier rises in the price of oil, often dramatic ones, should not have heralded real economy shocks as they are most often associated with an increase in demand. Real economy shocks have only been the consequence of oil price shocks when central banks have mistakenly decided that the short term CPI impacts are long term inflationary impacts – which they never are and never can be unless they are a trigger for excessive monetary tightening by those same central banks. Sometimes the OPEC oil cartel has managed to raise prices dramatically, but economic crashes following such actions should only occur if monetary policy overreacts. On Brexit I have been criticised for reasoning from a price change when celebrating the fall in the value of the pound. Surely it has fallen because of Brexit, and thus cannot also ameliorate the impact of Brexit? Macroeconomists have struggled to make clear exactly the nature of the potential Brexit shock. 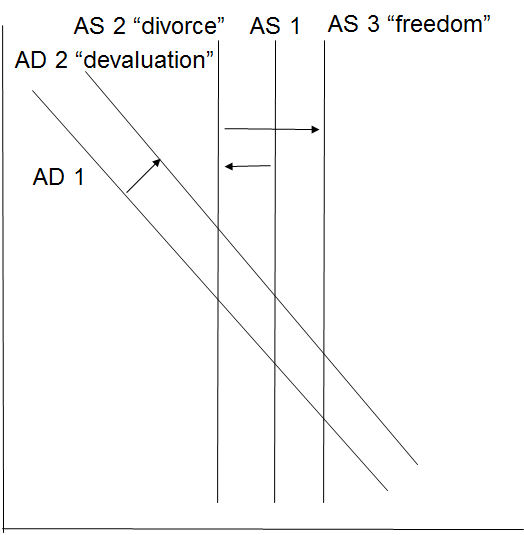 Is it an Aggregate Supply or an Aggregate Demand shock? Or both? 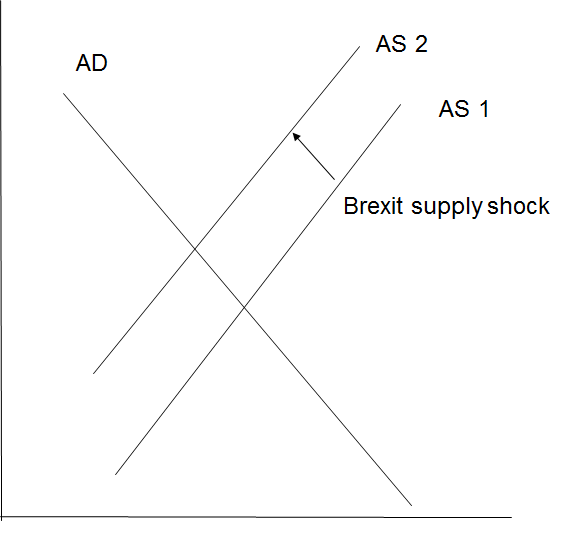 A “supply shock” is one that shifts the Aggregate Supply curve to the left, less is supplied at each and every price level along the curve. Such a shock would be inflationary as less output is available for the same amount of money around. The tricky wrinkle is that the shock is, potentially, to the supplying of overseas markets only, not UK ones. Brexit is firstly a threat to UK exports. This would be expected to impact the currency not the UK economy per se. This shock would mean less GBP demand and the consequent drop in the currency. The drop in the currency would then partially offset the impact as cheaper UK production would tempt other foreigners, even EU ones, to buy UK goods and services, shifting the AD curve to the right. How much so depends on the elasticity of overseas demand, an unknown, especially in advance. The potential supply shock from Brexit will also depend on the deal with the EU and the deals with the RoW now negotiated independently of the EU. These are huge uncertainties but uncertainty is normal. Businesses live with it all the time. Economic developments in Britain since the referendum suggest that a recession is coming. And the politics of the negotiation with the EU suggest the country will suffer a prolonged period of weak economic growth … It is clearly in the EU’s interest to be inflexible. The EU wants the UK to understand the trade-off between single market access and free movement, and to come to a decision about what is more important to Britain. If people elsewhere in Europe see mounting economic problems in Britain, they might be less likely to support anti-EU parties, for example in France. Many countries thrive outside the EU, why not the UK? Many countries inside the EU are in dire straits.The almost wide-eyed optimism that the EU is the best for the UK, or even many countries left in it, is sadly unimaginative. This optimism could be envisaged as the AS curve shifting right in the short-term. 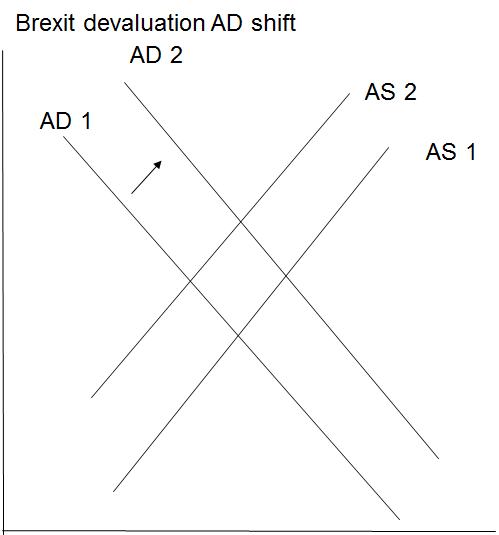 In the longer run the AS curve is usually considered more vertical, so Brexit may not really alter the level of RGDP but would have raised the price level. Insofar as the EU was holding back UK productivity the AS curve may indeed shift to the right, lowering the price level and increasing RGDP. The “pure” shock of Brexit was on UK politics. Spending decisions may well be put off. A surprise change in leadership of government is undoubtedly unsettling. Especially to non-Brits used to British stability. Part of the UK devaluation was this pure negative shock. And insofar as it was pure shock the impact will dissipate as politics settles down again, and the GBP will rally – as it has partly been doing so already. It is even possible UK political economy will improve, and thus turn into a positive demand shock. Cameron was an average PM, more style than substance. More importantly, Osborne was over-focused on the deficit and under-focused on NGDP growth – even if he did recognise the worsening of the problem he did nothing about it. And the Labour Party may implode, which is usually good for UK economic confidence – though not always. The Blair years with Brown at the Treasury were mostly good ones for the UK economy. being used to deal with UK debt by inflation. interest rates for 83 consecutive months and a £375bn QE programme. consumer debt, rising inflation and sustaining zombie firms are major risks. response could lead to potential recession risk. It is hard to know where to start putting these people right except to point out that low rates are a sign of tight monetary policy not loose or even ultra-loose, that 2.5-3.0% inflation is absolutely nothing to fear, and that only strong nominal growth can deal with “excessive” debt. Sometimes it feels like the UK is sailing between the Scylla of EU wrath for requesting a divorce and the Charybdis of tight monetary policy. I expect that like with most divorce proceedings, even the sometimes bloody ones, life moves on sooner rather than later. And I hope that now Osborne has left the Treasury the blockages to a more flexible monetary policy will dissolve. Growth is to be avoided at all costs! Could the cause of the next U.S. recession be too much growth? That is one risk of an unprecedented environment in which investors are betting heavily on a perpetually weak economic expansion. If markets are wrong–and the economy surges instead of sputters–the bad bets could roil the financial system, some economists are increasingly warning. “Ironically, one can think of a scenario where a stronger-than-expected expansion leads to financial trouble, which in turn puts into question the expansion itself,” said former International Monetary Fund chief economist Olivier Blanchard. Mr. Blanchard is the latest prominent economist to warn that a surprise upturn in growth may force the Federal Reserve to raise rates faster than investors expect. A jump in borrowing costs could catch many off guard, given that much of their portfolios are based on lower rates. “If the economy were to pick up faster than markets think, which I think has substantial probability, it could lead to some financial turmoil,” Mr. Blanchard, now a senior fellow at the Peterson Institute for International Economics, said in an interview. “When the Brexit smoke clears, if, as I expect, it clears, then the Fed should tighten,” said Mr. Blanchard. And given that it takes roughly a year for interest rates to have a substantial effect on the economy, that means the Fed can’t wait too long to raise the cost of borrowing to temper inflation. The economy is being smothered by the Fed. In that case all the risk is on the downside. Higher growth is a chimera! In a recent post, Scott Sumner argues that they are not particularly low conditional on NGDP growth. 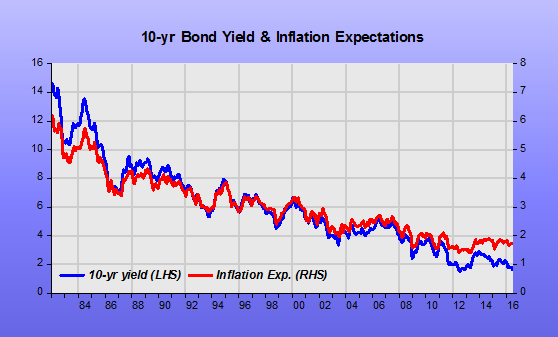 The chart shows that for a long time bond yields have been falling together with the fall in inflation expectations (from the Cleveland Fed), which were converging to the 2% “target”. 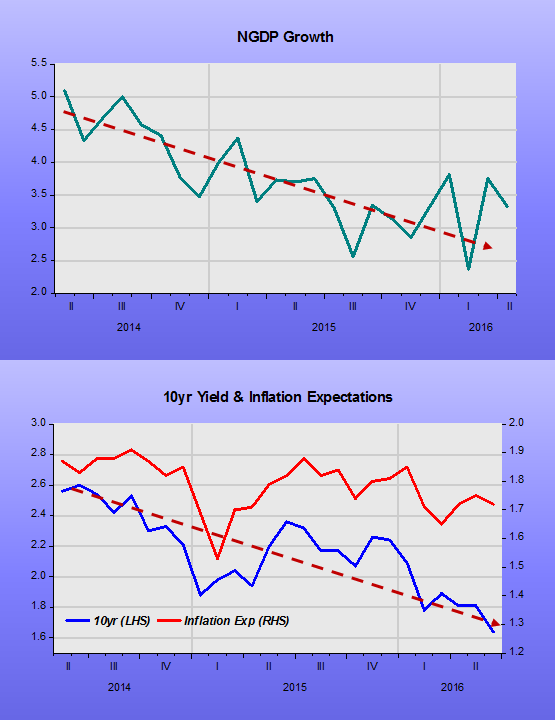 Since the Great Recession ended , however, there has been a disconnect, with the yield continuing to fall while inflation expectations, although below target, have remained stable. This disconnect can be attributed to the low growth of NGDP which, after tanking in 2008 has never “tried” to get back on the “saddle”. The chart illustrates. 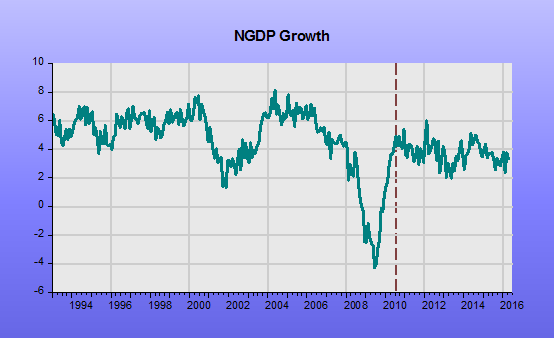 Once the recovery began in mid-2009, NGDP growth accelerated. After mid-2010 it “tapered off”. So there would be no “catch-up” growth. 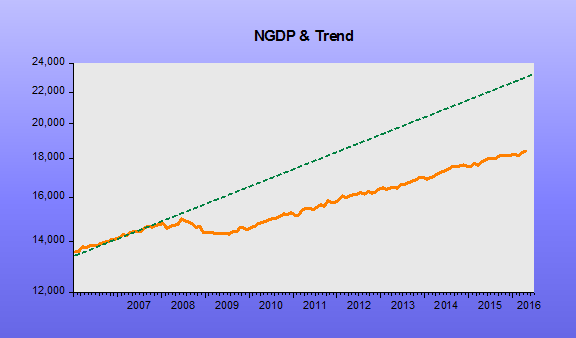 The NGDP growth chart illustrates. With inflation expectations below target and expectations of low nominal and real growth going forward, there´s no reason for yields to rise! And so they fall. Notice that the start of the rate hike talk in mid-2014 clinches the “low nominal growth-low inflation-falling yield” scenario. …Right now we’re just in a situation where there is just not a lot of data on actual actions because, for various reasons we’ve held off a long time on our first rate increase and then we held off so far on a second rate increase. This I think is wrong; lack of action is a policy choice as much as action. Williams seems to think the only useful information about the Fed’s reaction function comes when the Fed changes rates. This implies that holding policy steady conveys no information. I would argue that steady policy is in fact signaling the Fed’s reaction function, and hence, in combination with the data flow, financial market participants are concluding that the Fed will continue at a glacial pace regardless of what the “dots” say. Indeed, I would say that financial market participants are signaling that the Fed’s stated policy path would be a policy error, an error that they don’t expect the Fed to make. I guess you could argue that the market doesn’t think the Fed understands it’s own reaction function. And given the path of policy versus the dots, the market appears to be right.